it free online if you're interested in the gory details. 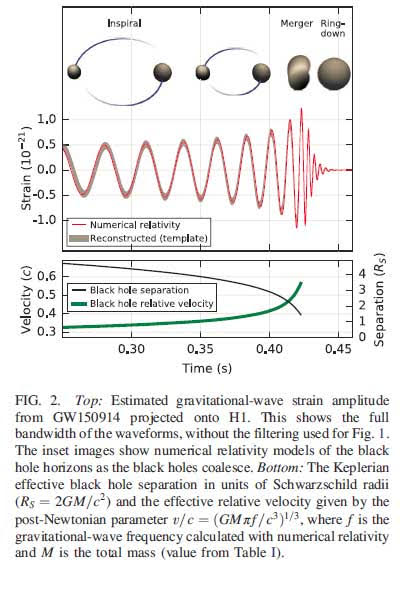 The first image from the LIGO Collaboration paper shows the theoretical illustration of the merging of two black holes. As the black holes orbit each other and continue to lose energy through radiation of gravitational waves they begin to in spiral and get closer and closer together. As this happens the wavelength of the gravitational waves gets shorter and shorter and the amplitude gets higher and higher until the final merging and ring down. The second image shows the actual data collected by the two LIGO observatories. might be observed. 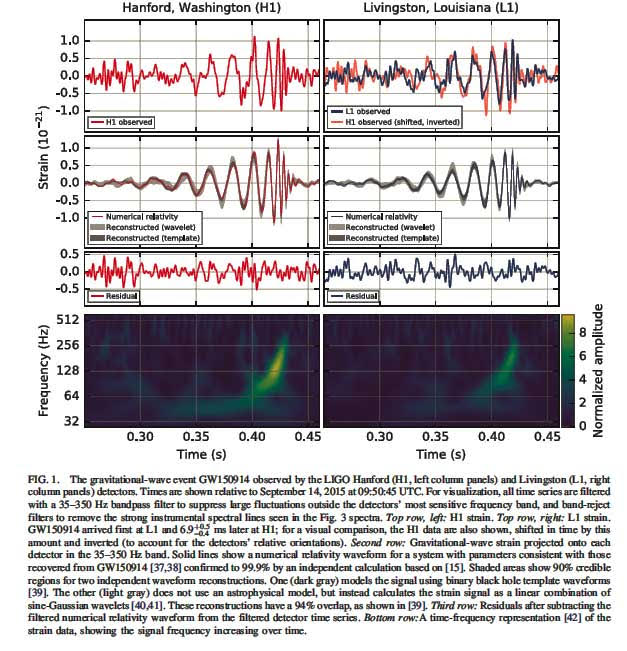 The frequency of the detected gravitational waves goes from about 35 Hz to 250 Hz. Analysis shows that the two back holes, one weighing in at 36 times the mass of our sun and the other at 29 times. The resulting black hole following ring down weighs in at about 62 times the mass of our sun. Notice the difference between the incoming mass of the two black holes and the merged black hole. This mass difference of 3 times the mass of our sun is radiated away as gravitational waves. That is pretty amazing and represents one of the most efficient production of energy, much more so than the fusion of hydrogen in stars. Ok, ok, now off with the physicist wannabe hat and back to the ongoing saga of learning about astronomical technique. This week Resident Astronomer Peggy was able to attend the star party at Blackstar Canyon. Recently it's been hard for her to get away because of the demands imposed by Astronomer Assistant Ruby, who would destroy the place if not controlled, but this week, Surrounded by Dogs, Bob, took up the challenge, which allowed Peggy to escape for a while. So, she was able to use her binoculars to scan the sky while I tried out a new auto alignment attachment. This new component is a small camera and new software that mounts on the telescope and performs an automatic alignment of the telescope. I don't have to do much of anything except turn it on. The new camera looks at the night sky and from the observed stars determines in which direction the telescope must be pointing in order for that exact star pattern to be found. This is a great new tool and makes the setup and alignment of the scope a lot easier. Only one thing is left for,the amateur to do and that is to check the alignment camera is pointing in the exact same position as the telescope optical axis. It should be close, but there is always a bit of misalignment do to mounting screw and slot tolerances. I tested how well the alignment was performed by commanding the scope to slew to Jupiter. Jupiter showed up in the eyepiece, not centered, but at least in the field of view. After all, as it turns out, I didn't follow all of the normal rules about centering a test star exactly at the center of eyepiece view. But it was close enough and I was excited about trying to do something that I had never dared or been able to do before and that was to see if I could get the scope to point at the Comet Catalina. Well, I pushed the control button and the scope moved and wow, it happened that a comet like smudge really did show up in the camera image. Hooray, finally captured a comet? But wait, the smudge was brighter than some of the stars in the same field of view and that shouldn't be the case. Darn, it seems that bright smudge was probably just one of the ordinary stars that was sort of smeared out by tracking error during the 25 second exposure. So we left the evening with a sense of success and congratulations from other amateurs, but we all sort of knew that it didn't quite look right. Later, when we returned to the observatory, I couldn't find much of anything at the location in the image where we had initially thought the comet was. But there was another smudge in the upper left portion of the image that definitely was a comet like or maybe just a spiral galaxy core. So how to tell of the smudge is the comet Catalina or not? Well, I looked up in my star charts and galaxy charts and there was no galaxy listed as being in the image field of view. There was one dim spiral galaxy, C5, but it was like three camera field of views away from where the camera was supposed to be pointing. So could it be that the telescope alignment was off that much? Or was or is it the case that the smudge is indeed the comet? I still don't know the answer. My plan is to reexamine the image and try to overlay the catalog star field on top, using the techniques I've been developing in the last 3-4 weeks and see just where the telescope was pointing. Could it be that the automatic alignment was not as good as I thought it was? Was Catalina finally captured? I don't know, but the investigation continues. I've got half a dozen ideas that represent possible source of error and they all have to be checked out before I can know what the smudge is. Check out the image and look in the upper left hand corner and see what you think. 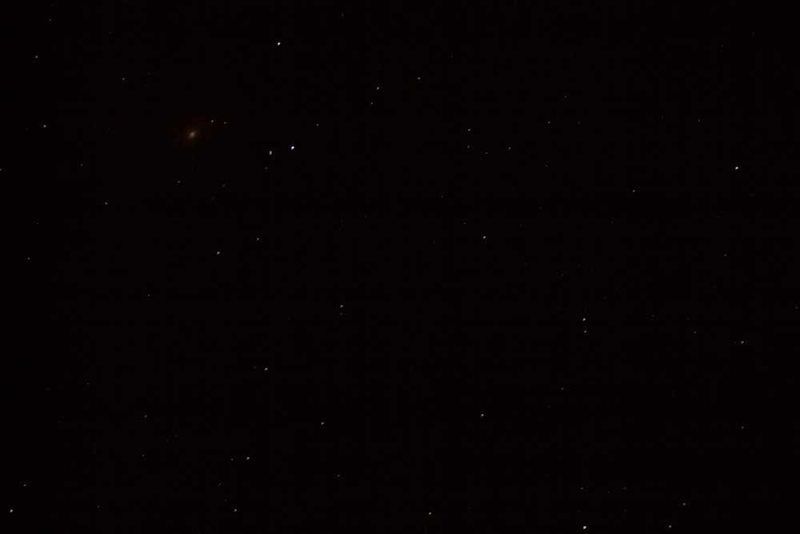 Is that smudge the core of some dim Galaxy or is it Catalina?